When its time to buy or sell… consider a Montana Auctioneer. From Equipment, Farm & Ranch, Real Estate, Livestock, Personal Property & More Montana has some of the best auctioneers in the nation. Want to see your sale up on the Montana Auctioneers Association website or social media pages? Click the link below to find out how you can get your upcoming event or business information added to our website. The Montana Auctioneers Association, our members and our board would like to invite you to join our auction family. The Montana Auctioneers Association has been serving local auctioneers and the auction community in Montana for over 57 years. Click the link below to see how joining could benefit you. 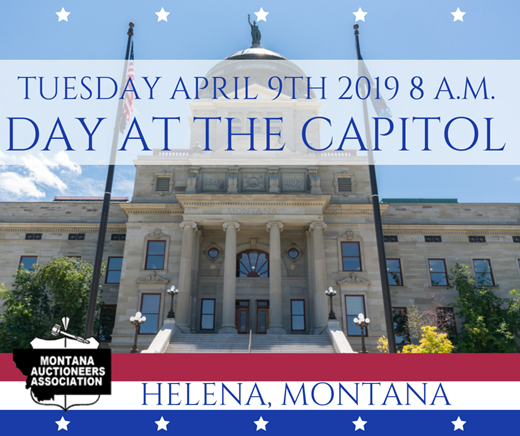 Please make plans to join the Montana Auctioneers Association Tuesday April 9th 2019 at 8:00 for the Inaugural Montana Auctioneers Association Day At The Capitol. Members will be able to be a part of history as we will advocate for the auction profession at the Montana State Capitol. Senator Scott Sales (R) has offered to donate a Montana Flag in which we will be selling at Auction on the House Floor while in session. Senator Sales and Sen. Steve Hinebauch (R) have been working with J.K. Kinsey to organize this event. We will send out a complete itinerary closer to the event. This will be a great way to kick off National Auctioneers Week with many photo and video opportunities! The Montana Auctioneers Association was founded in 1961-1962 by a small group of state auctioneers. The ultimate purpose of the association was to aid member auctioneers to improve auctioneering skills and to grow in the auction profession. This purpose has not changed. For many years, the State Association supported a reciprocal agreement with the National Auctioneers Association, with membership in both associations a requirement. Although this requirement no longer exists, the Montana Association continues to support the goals, objectives, and activities of the NAA. The state bylaws, goals, and objectives are closely linked to those of the National Association. MAA Winter Magazine - Read Now! Montana Auctioneers Association shared a post. More coverage from Day at the Capital! Today there will be a live auction on the Senate Floor to benefit our colleague who was paralyzed in a snowboarding accident.